However you get their attention, what matters is what you do with it. JK Design is an agency that gets it. What differentiates them is as much about what they do as what they don't do. Concept and most of the words by me with some finishing touches and moral support from JK's Jim Galligan. In 2017 I worked with Munich Reinsurance of America's marketing department to, among other things, create a set of white papers for their new Reinsurance Products. The full set is nestled in the subpages here. Or you can click through the images below to read more. I've never seen anything quite like the identity and tone of Main Line Health done in health care before. It's genuine, completely unpretentious, serious when it needs to be, clever and even downright funny when it can afford to be. It's human, plain and simple. I was a fan before I had even met the people behind it. I got to work on several campaigns within the MLH family, including Maternity, Urgent Care, Primary Care, and Lung Cancer, each with a different set of rules and ideas driving it. Above are some of my favorites. The Philadelphia Orchestra had us create a visual identity for their community outreach program, HEAR. This gallery includes the Bifold Brochure and banners that were displayed at the inaugural concert, a shot of the banners in action. The name and meaning of HEAR was decided before I touched it, but I created all the explanations, as well as the tagline "All In", a concise line that pulls double duty describing both the Orchestra's commitment to the community, as well as their goal of affecting the community in it's entirety. This year, Longwood Gardens added a new season between their Spring Blooms and their Nightscape event. Summer at Longwood would feature later hours, a beer garden with exclusive brews on tap, food, and live music under the sunset at one of the most beautiful gardens in the country. 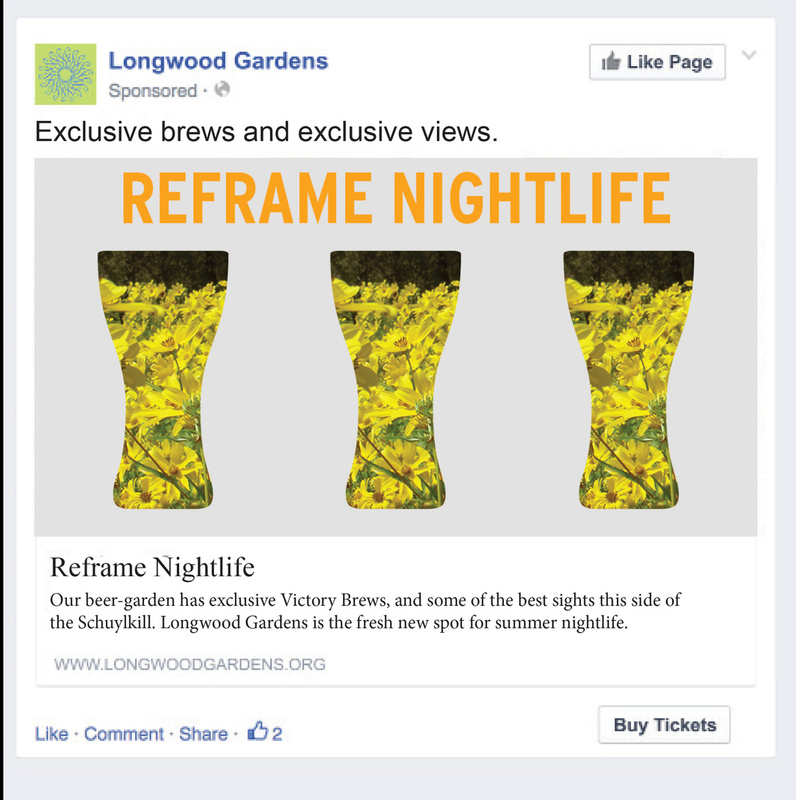 Working with designer, Bernardo Margulis of This Makes Me Happy, we challenged people to find a new kind of nightlife at Longwood Gardens. Inspired by the 150,000th ad I saw telling me I was beautiful, I muttered under my breath, "Dammit, I don't need an advertisement to tell me that." and began exploring what a beauty brand that didn't patronize it's customers so much might look and sound like. Can self-aware, no-bull beauty messaging subvert the ubiquitous body-image conversation and still make people want to buy cosmetics? I started writing out everything I found fundamentally flawed about beauty messaging and how a brand could avoid falling in these clichés. From this I developed a manifesto, and from that manifesto, a brand. So how does a brand that doesn't sell beauty still sell make up? A cleaner way to clean. This campaign for Method Home cleaning products was all about the bottle. The recyclable plastic and people-healthy, earth-friendly ingredients makes for a much cleaner way to clean, but I wanted to keep the experience both conceptually and literally within the bottle. The unique Method tear-drop shaped bottle could easily be an icon of the industry, so I built the visuals of the campaign around it. Apart from traditional print and outdoor ads, the campaign featured an alternative "Clean Graffiti" concept. This process builds a visual by cleaning a design into the dirt on the sides of buildings with stencils and a power-washer. For an online tablet experience I wanted to repackage the wealth of information Method has available on their web page in an experience as colorful and fun as their physical products. The nav is contained in a touch-responsive pinwheel of Method handsoaps, and the pages are displayed as blobs of soap from the dispenser. There’s no place quite like Philadelphia, besides its historical significance and rich cultural landscape, it also boasts some of the best restaurants and bars in the world. That’s what got us the number 3 spot in New York Times’s "Top Places to Visit in 2015", (behind only Milan and Cuba, making us the top spot in the US). And yet, Visit Philadelphia was still having trouble getting urban adults ages 25-54 from our Mid-Atlantic neighbor cities. In our research, we found that selling Philly as a historical site for tourists not appealing to this demographic, actively turning them off of visiting Philadelphia at all. From this insight, an interesting challenge was presented: How do you sell tourism to people who don’t want to be tourists? Our solution was to make an interactive tool that would help out-of-towners experience Philadelphia the way locals do. A smartphone app called “How To Philly” would allow locals and tourists alike to explore and expand a crowdsourced, curated collection of food, drinks and experiences that might not make it into your typical tourist brochures. When users find something awesome, weird, or delicious in Philly and snap a picture to show their friends, we ask that they use our promoted hashtag #HowToPhilly, as well as geotag any images they wish to be considered. This can be done through the app, or through social media sites like Instagram or Twitter. Now we have a database of cool things to do, see, eat or drink around Philly, and where to find them. This piece was from an ill-fated campaign I worked on as an intern at D4 Creative in Manayunk. The concept was pushing K'Nex, an interlocking structure building toy for older children, as brain food. The assignment here was to take a campaign out of a magazine and make another ad that fit in that campaign. The campaign, which can be viewed here is an anti-bullying PSA that works by bullying the reader to help adults remember what it's like and why it's an issue. Designed as a typographical exercise in content hierarchy, I used colors and shapes, and different weights of Futura to differentiate each section as well as create a bold retro aesthetic. Deciding this looked like a menu for a restaurant frequented by American Psycho's Patrick Bateman might frequent, my writing partner decided to take all the menu items in a psychotic, morbid direction. The client was a low-key, bare-bones barber shop that wasn't offering anything more or less than a good-looking classic cut. The brand begs for a simple yet attractive execution. Conceptual lifestyle and culture magazine/blog "The Drip"'s brand identity was built as a project for intro to typography. It relies on thick geometric sans serif fonts, asymmetrically balanced designs, and text blocks with neat corners to make the bold, clean, but slightly off look of the brand. These were general K'Nex shirts to be given out as prizes for building contests as part of our ill-fated K'Nex campaign. The shirts were written by my friend Josh Zimmerman and designed by me.